Louisiana Fishing Charters was founded by Captain Randall Shaw. Captain Randall grew up with a passion for inshore fishing. 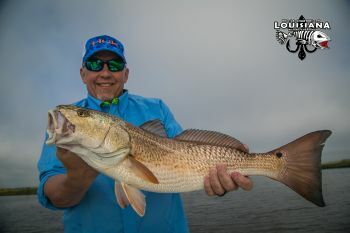 As a teenager he fished from the shorelines of Lake Pontchartrain and learned the annual habits of the redfish, speckled trout, and other inshore species that move in and out of the lake. As soon as he was old enough to drive he bought his first boat and began exploring the marshes of Delacroix, Hopedale, and other nutrient rich wetlands surround the New Orleans area. As and adult, it wasn't long before Captain Randall left the hustle and bustle of the working world and set up shop full time operating fishing charters in Delacroix, LA. He chose Delacroix as the base of his operations for its seemingly endless areas to fish and its robust fish population. His main goal with LFC was to create the most professional and friendliest charter fishing business in the industry. Throughout the years, Louisiana Fishing Charters has made professionalism a cornerstone of what we do. When a group of clients show up we want them to feel like they have known us for a long time- even if its the first day we meet. We will always greet you with a smile, a clean boat, and top quality equipment to fish with. Our lodging is second to none in Southeast Louisiana and we will make sure your stay is not one to forget. Our close proximity to New Orleans can make for a fun day of fishing followed by a trip to one of the top culinary and cultural meccas in the world. Unfortunately, we cannot control the fish, but as part of our commitment to providing a great experience, we track schools of fish annually as the move around the marshes of Delacroix. Our team works together to make sure all of our boats are in the position to catch fish. We study our weather and tide guides daily to ensure we understand fish patterns for that particular day. We make sure to stock our boats with the right lures and bait for the species we target. When it comes to putting our clients on fish, we promise our efforts will exceed your expectations. We do have to brag on the quality of inshore fishing here in Southeast Louisiana. We believe this is the best inshore fishery in the entire United States. We hope that you will come join us here at Louisiana Fishing Charters and experience a fishing trip that you will never forget. Louisiana Fishing Charter's crew has Tommy and his family headed back home in 20 minutes, fish cleaned and bagged. holidays with great winter rates! Louisiana Fishing Charters took out George and his friend William yesterday aaround 10am. First went to Oak River and picked up a few nice ones fishing the drop offs with a little live shrimp and shrimp creole Matrix Shad on the bottom. When the bite slowed down we moved down the pencil canal to a good looking point and finished off are limit of trout and also caught 4 reds and one 42 lb drum. Great Afternoon. To book your trip give us a call at 504-669-1263. Check are website for great winter rate! Louisiana Fishing Charters took out Emilo and his brother yesterday morning.We waited till about 8 am to leave the dock due to the freezing temps. Are first stop was the west side of Oak River.We caught a few speckes and moved up the canal fishing the small cuts, around 11am the wind died down and it warmed up just enough to get the bite going. We fished matrix shad under a cork about 18-24 inches.At about 2 pm the bite stoped and we headed back to the dock with 15 reds, 52 specks, and 6 bass. Great trip but a little chilly! Give us a call to book your next trip. We have great winter rates on are website at www.la-charters.com or give us a call at 504-669-1263. Captain Randall of LFC took out the Clyburn group. The trout were on, started at the common spots in black bay with fishing the bottom and with corks and had are 75 trout in no time.Live shrimp were the ticket but also caught some on the vudo shrimp. This is the best I have seen Black Bay this year. Get your rods and reels ready for the weekend! 2,3,and 4 angler trips available. Louisiana fishing charters took out mike Henderson and his buddy's. As everyone knows from pervious post the weather was windy and little tide. We ran from delacroix to black bay and got to are first spot and started catching trout but a lot of throw back. We waited to see if the wind would lay down but it didn't, so we made one move and ended up with 49 trout. We could have finished are limit but due to the early throw backs we were low on bait. Mike and crew also caught 3 bull reds, 5 slot reds, 2 drum, and one snapper.rnTo book your trip call 504-669-1264 or logon at rnLa-Charters.com!